7min walk from Miyanoshita st.
get off at ‘Hotel-mae’ bus stop. it’s near by La Bazza. 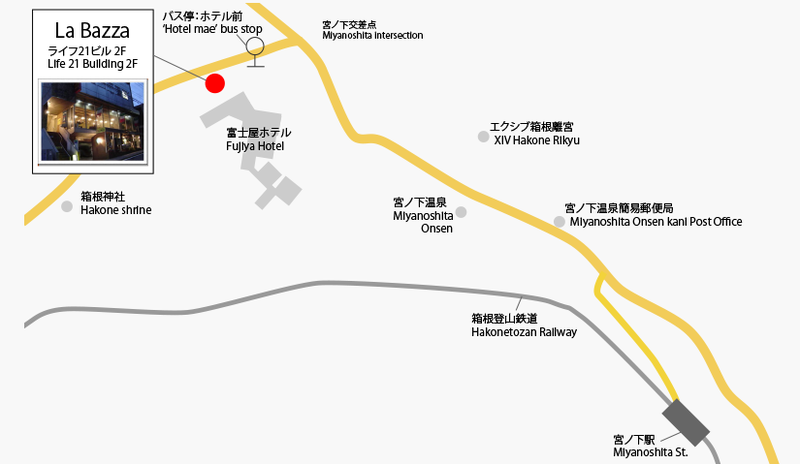 ‘Miyanoshita-onsen’ bus stop is also available. it takes 5min walk to La Bazza.The bus route and timetable is here. Odawara-Atsugi Rd. → Hakone-guchi → Odawara-Hakone Rd. → National Route1. There are 5 parking spaces in building basement. Odawara-Atsugi Rd. → Hakone-guchi → Odawara-Hakone Rd. → National Route1. There are 6 parking spaces around La Bazza. please ask freely. Sometimes we are closed for the party. Please see the calender of “Reservation” page.